We specialize in wedding gown alterations; we measure, trim, and sew your gown so you look your best on your big day. Martinizing uses museum quality archival methods and techniques when restoring and preserving your wedding gown. Our wedding gown preservation packaging is like no other gown preservation service in the Milwaukee & Waukesha area. Your dress undergoes a bridal gown restoration and preservation process before it is placed in its archival chamber. These processes include gentle solvent baths, gentle tumbling techniques, and detailed hand finishing. Below are the bridal gown preservation steps we follow to maintain the beauty and integrity of your wedding gown. Wedding Gown Inspection: Your bridal gown is meticulously inspected for stains. All beads and trimmings are tested for serviceability prior to the bridal gown restoration and preservation process. Preliminary Maintenance: Replacement and / or reinforcement of beading and trimmings and other minor wedding gown repairs as needed. Some beading may need extensive covering or reinforcing which could incur an additional charge. Clean: Your gown is inspected for any stains to be removed prior to being moved on to the cleaning process. Cleaning process vary based on the material, trim, and type of stains. Post Cleaning: Bridal gown stain removal is completed at this stage. A careful inspection for stains and residual matter is performed. Bridal Gown Reinforcement: Beading, trimming, ornamentation, are all tightened and replaced if needed. Hand Finishing Services: Special attention is given to the designer's line and drape during the pressing process to ensure your wedding dress is pressed to perfection. Beading, trimmings, lace, pearls, sequins, rhinestones, and other embellishments require a high degree of attention during the hand finishing process. Client Inspection: We meet with you for a final viewing before your bridal gown is placed in its archival chamber. Wedding Gown Archival Chamber: Your wedding gown is wrapped and secured in acid free tissue paper, carefully folded, then wrapped in unbleached muslin and placed in a custom acid free museum quality archival chamber. We then place a muslin cover with optional monogrammed over the chamber. Wedding Gown Storage: It is recommended you store your preserved bridal gown in the closet of a spare room in your Milwaukee home. Never store your wedding gown in an attic, garage or basement where it can be exposed to elements capable of compromising the wedding gown preservation process. Lay the box flat to prevent shifting during storage. Bridal gown preservation from Martinizing Milwaukee dry cleaners will keep your wedding dress like new for generations to come. Your children and grandchildren will be able to see your wedding dress the way it looked on your special day with wedding gown restoration, preservation, and storage from Martinizing. It will be kept in such pristine condition they might even choose to wear it themselves someday! We take every possible precaution to ensure the timeless preservation of your wedding dress, by immediately cleaning your wedding gown, before using our Museum quality archival techniques to store your wedding dress, keeping it like new. Your bridal dress is a sign of your love and marriage and deserves the best treatment. 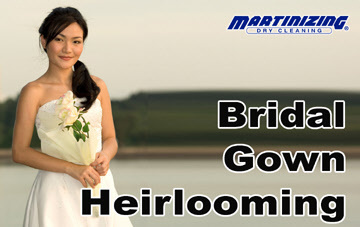 Martinizing dry cleaners are the unquestioned Milwaukee wedding gown preservation, restoration, and storage leaders. To learn more about preserving your wedding dress, contact Martinizing today, and give yourself a gift lasting your entire lifetime and beyond.